Quinoa has become such a staple in my diet. Whether I'm having it cold with a salad or even warm with chicken, I love this grain! Quinoa is one of the very few grains that contains all 9 essential amino acids, making it a complete protein. For anyone who follows a meatless diet, this is a crucial protein substitute for the body! Not only is it packed with protein, but quinoa also contains a ton of fiber and vitamins and minerals. Though I normally prepare my quinoa for a savory dish, I've always been curious about the many different ways you can cook and eat quinoa. I've seen recipes for "puffed" or popped quinoa, morning oats quinoa, and even crunchy oven baked quinoa. 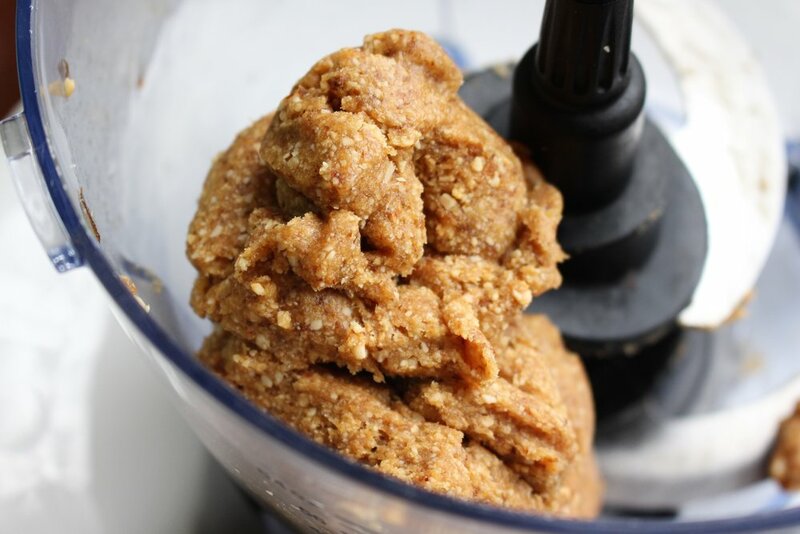 I've also seen a ton of sweet treat recipes that I couldn't believe had quinoa in them! After searching for some inspiration in Pinterest, I decided to just go with the flow and make something super simple, plentiful, and tasty that we can enjoy all week and weekend! Balls are easy peasy and always take no time at all! 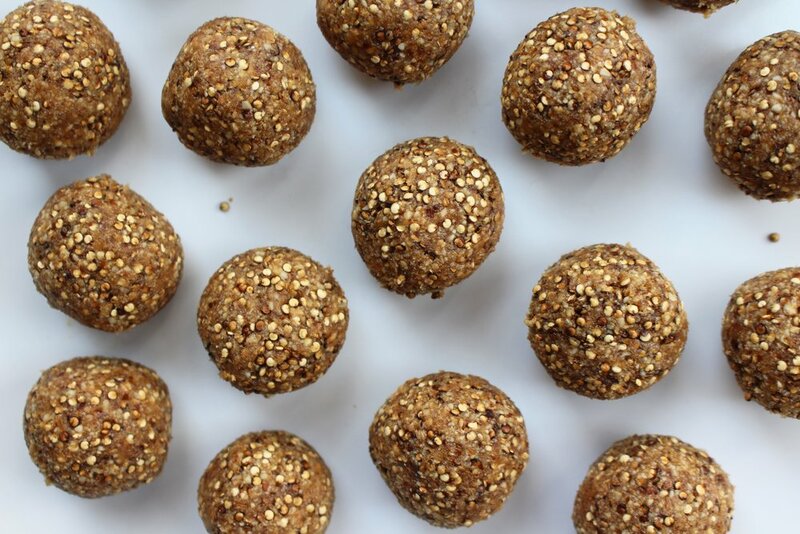 You can use just about anything you have in your pantry for a healthy and delicious treat. I decided to stick to three main ingredients: dates, cashews, and roasted quinoa. Yup you read that right, I'm finally trying a new and slightly odd cooking method with my quinoa. 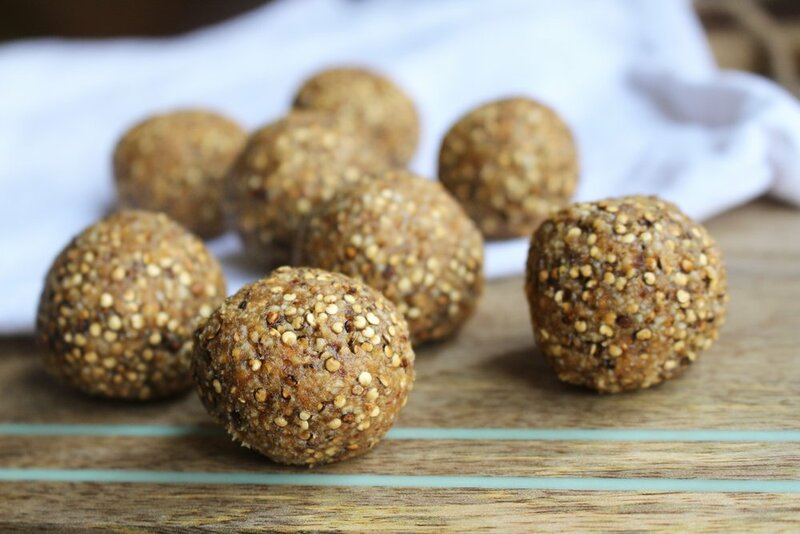 Because of the naturally nutty taste that quinoa already has, roasting the grain actually enhances that and gives these balls much more flavor than you would expect. 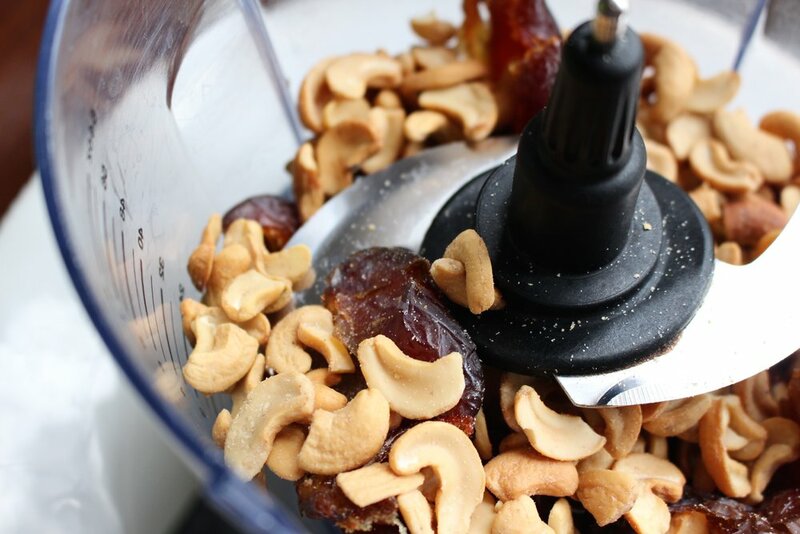 Place cashews and dates into a food processor and blend on high. Once the mixture forms a ball and comes away from the sides, it is ready! Transfer to a large bowl and begin roasting the quinoa. So besides the ease of putting everything in a food processor, there is one other step - roasting the quinoa. I simply heated a non-stick pan on medium heat for about five minutes, or until a water droplet would quickly evaporate. Once ready, add 1/2 cup of quinoa and shake around so they always lay in a single layer. Let the quinoa cook for 5-10 minutes, until golden brown or darker in color. If you're making a larger batch, you can also roast quinoa in the oven. Spread the quinoa out on a foil-lined baking sheet and bake at 450º for 5-8 minutes. Shake or stir the quinoa around half way through to ensure even roasting. Pour the cooled quinoa into the date mixture and work together until it is completely incorporated. Roll into 12-15 balls and let cool once again. Once the balls have hardened, it's time to devour! 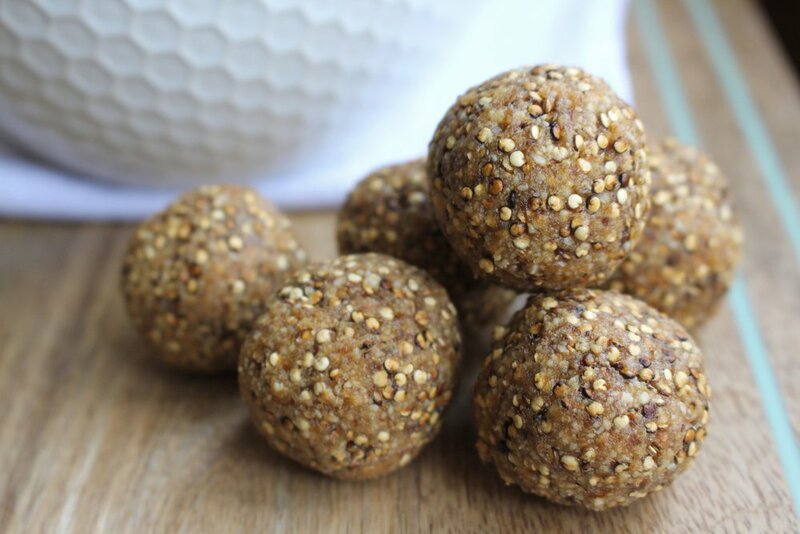 I was so surprised with the coffee-like flavor and intense nutty aroma that these little balls gave off! They are sweet, bitter, and savory all at the same time. They are smooth and buttery without being too soft and fragile. I absolutely love this recipe and will quickly be making more! Let me know if you have ever cooked quinoa in a not so traditional way! I would love to hear and see the many recipes you guys love with this incredible super-grain!